Roxana Peroni, born in Buenos Aires in 1975, is a Biochemist graduated from the Faculty of Pharmacy and Biochemistry of Universidad de Buenos Aires (2000). 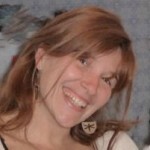 She completed her PhD thesis (2008) at the ININFA within the framework of a CONICET Postgraduate Scholarship, developing her teaching career in parallel. She has continued her research at the Institute and currently serves as Assistant Professor of Pharmacology in FFyB-UBA, and as Assistant Investigator in CONICET in the LABORATORY OF DRUG TRANSPORTERS PHARMACOLOGY. In her free time, she enjoys his family and organizes meetings with friends. She transmits to all of them his love for rock, and whenever she can, she enjoys a recital so as not to lose the habit.